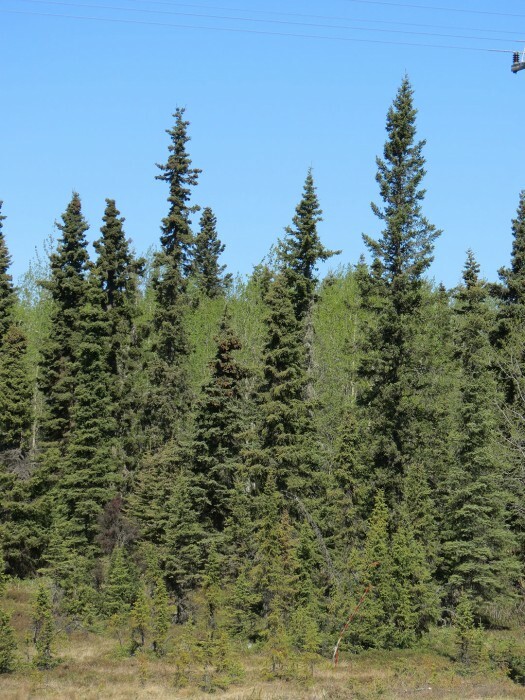 It was during a previous trip to Alaska and also Canada when I fell in love with these hopelessly tall, skinny trees. 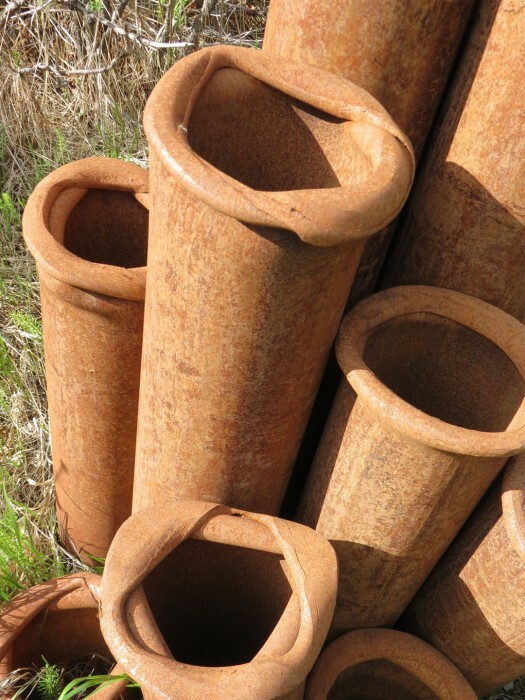 It seemed, to my novice eye, that they were so fragile that any strong wind would simply blow them over. 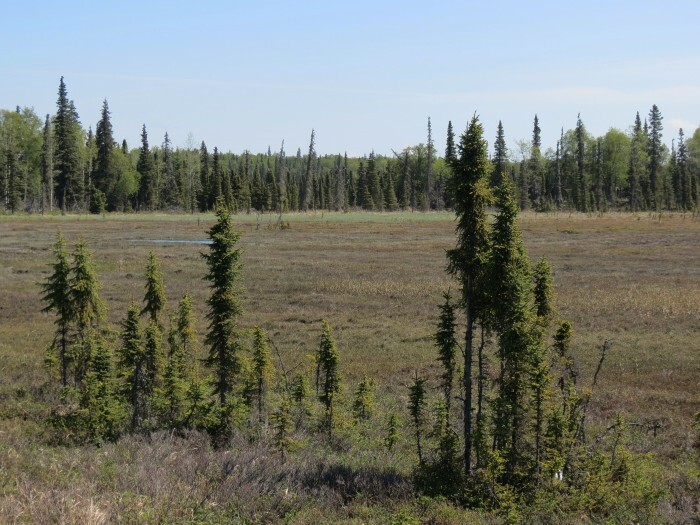 At about the same time, I was searching for a Northern Hawk Owl, an elusive species that I had been told liked to sit in the very tops of these trees! So, I drove around this very large state looking, and looking and looking. they also feature prominently in Land of the Midnight Sun, also from 2009 and featured in my book. 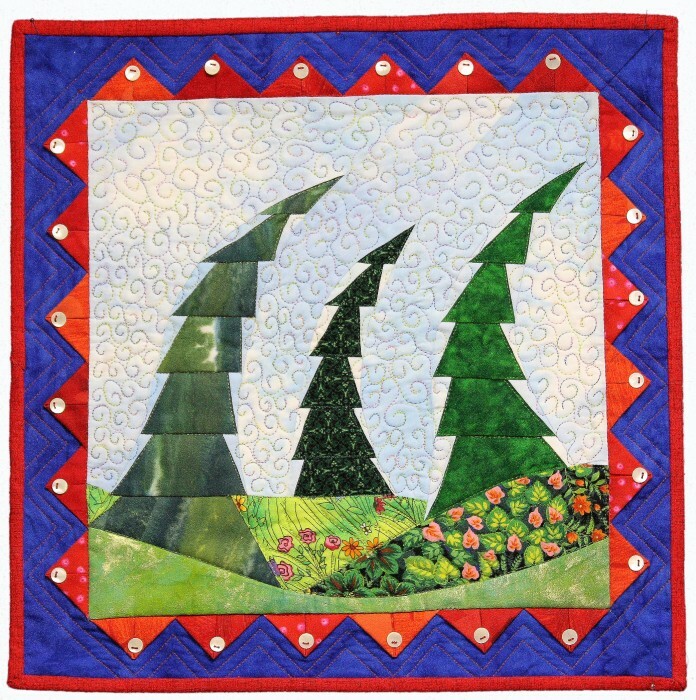 However, this quilt was inspired more strongly by the discovery of a fabric called Aurora Borealis in an Alaskan Quilt Shop! What fun! I hope I get to return one day! What inspires you? 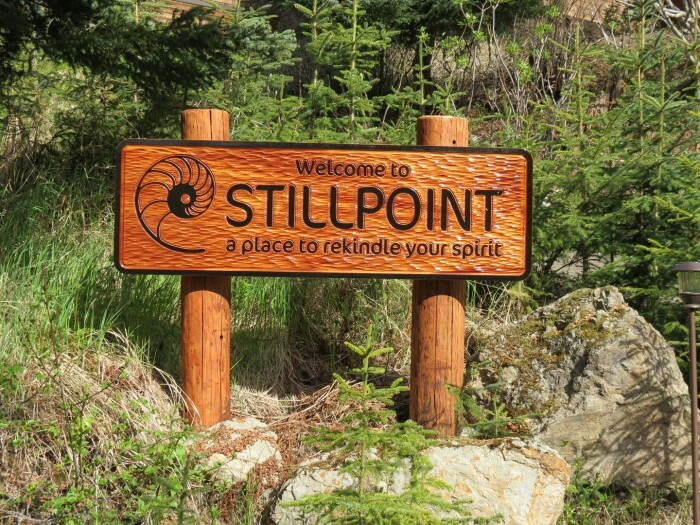 We waved good-bye to the amazing staff at Stillpoint Lodge. Most of them are working throughout the summer season in return for room, board and tips! Each was dedicated and professional. In conversation with several of them, I learned that most had found the job on a site called CoolJobs which bills itself as the coolest jobs in the entertainment industry! And then we were off, to board the Danny J and return to Homer. Once there, the hustle and bustle was impressive as everyone’s belongings got schlepped up the VERY steep board ramp (tide was out) and into the various vehicles. We joined in the melee, packing up Maret’s SUV and heading down the road. However, it wasn’t long after that that Maret suddenly pulled over on the side of the road. There she was! 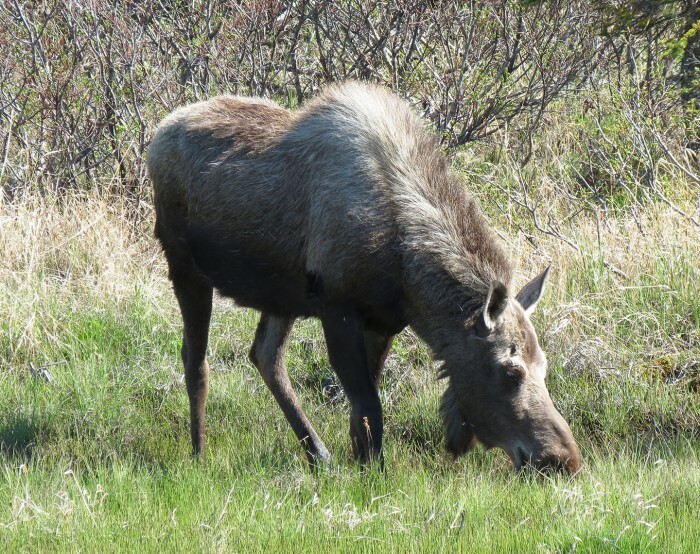 Our first really good look at a moose, not 30 feet away. She seemed unconcerned abut us, taking many photos from the photography blind also known as a car. We were careful not to get out so as not to disturb her meal. What a treat! 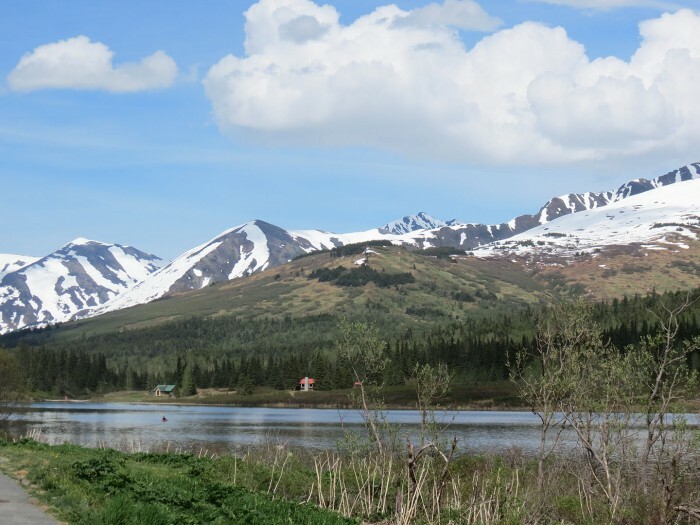 As we drove northward, we looked out across Katchemak Bay at the other side of the peninsula toward the distant mountains. 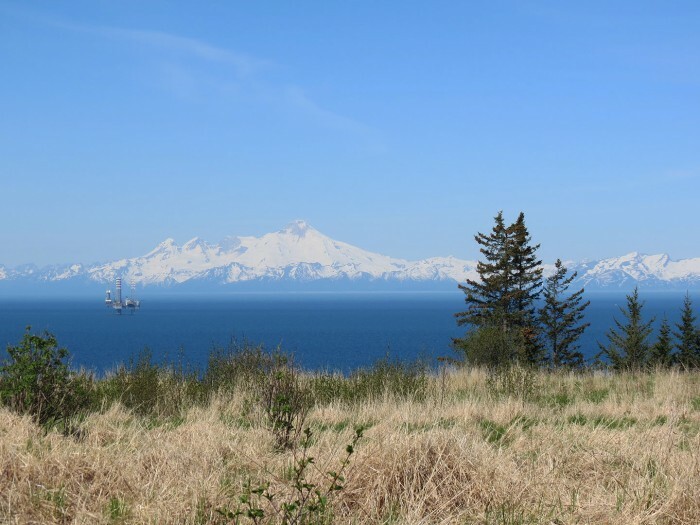 That part of the peninsula, which is roadless and sans humans, leads to the elusive Aleutian Islands. As we neared the Portage Glacier and the run around Turnagin Arm, we stopped for lunch and some photos. It was our farewell kiss to the magnificence that is our northernmost state. 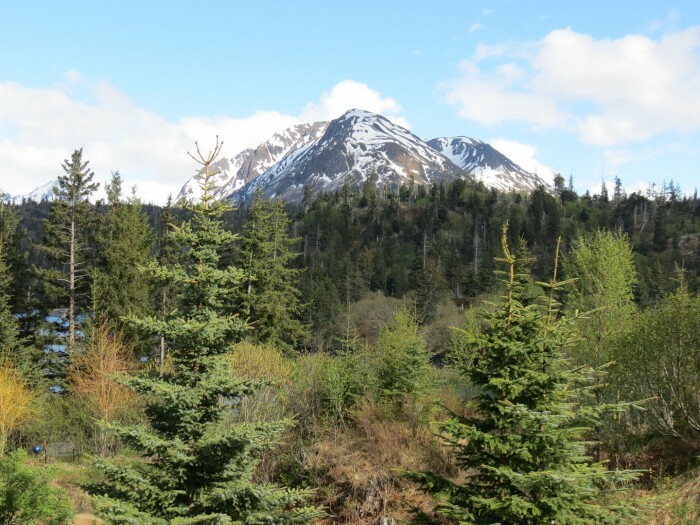 But, true to it’s very nature, Alaska still had a couple of treats up its sleeve. Among the short grasses, a veritable bouquet of yellow bloomed across the countryside. 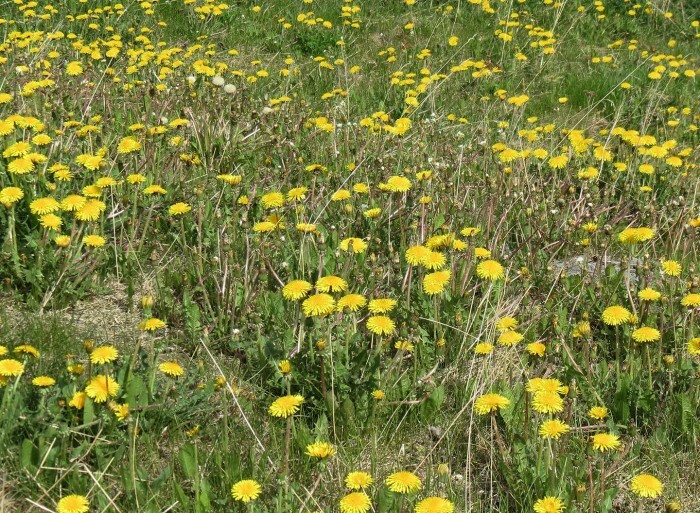 It was the lowly dandelion, brilliantly shining amid a thousand siblings. 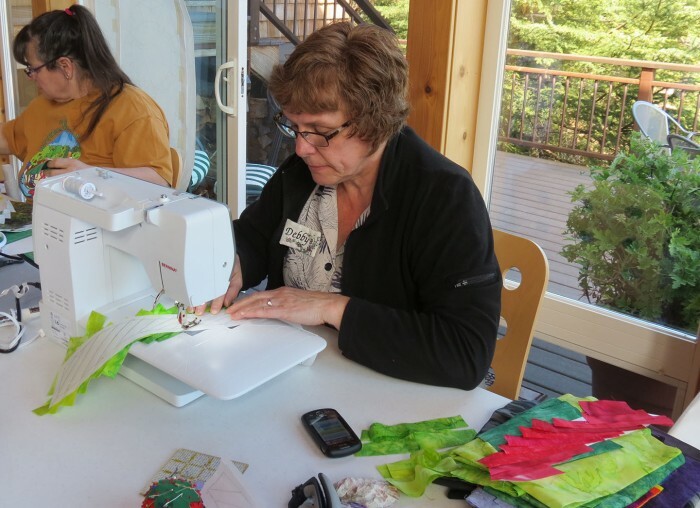 Again, thanks to Maret Anderson of Seams Like Home for this amazing experience! Were fast drawing to and end. 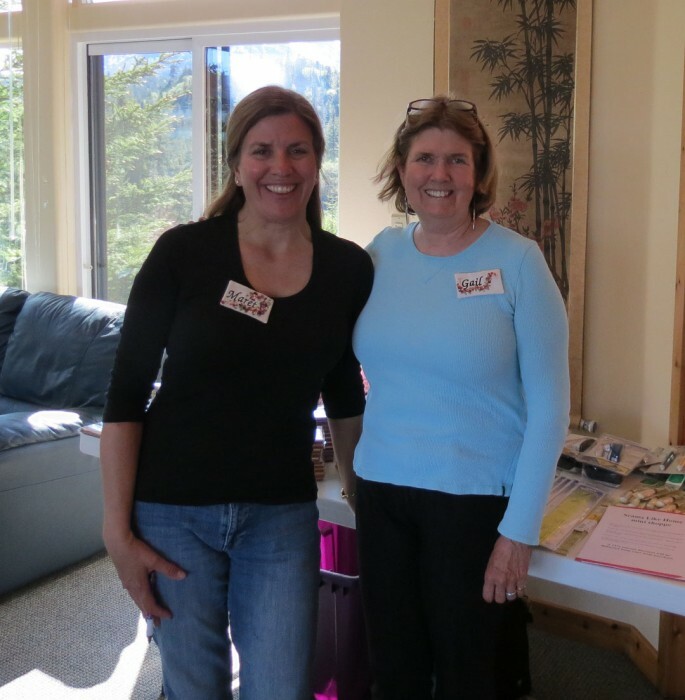 Many, many thanks to Maret Anderson, owner of Seams Like Home in Anchorage, Alaska for organizing this retreat and making our wonderful Alaska adventure possible. It was simply the best! The students thought so too. Jyl had opted to bring a pre-printed panel and design fillers to coordinate. 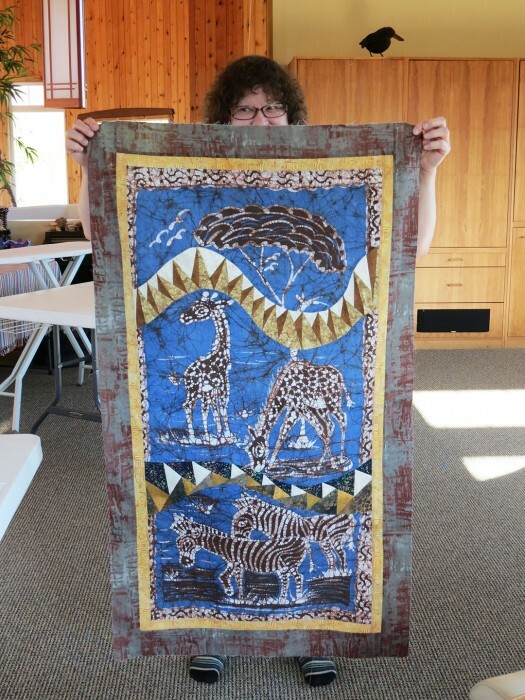 She completely finished her quilt top! It was simply the best time ever! 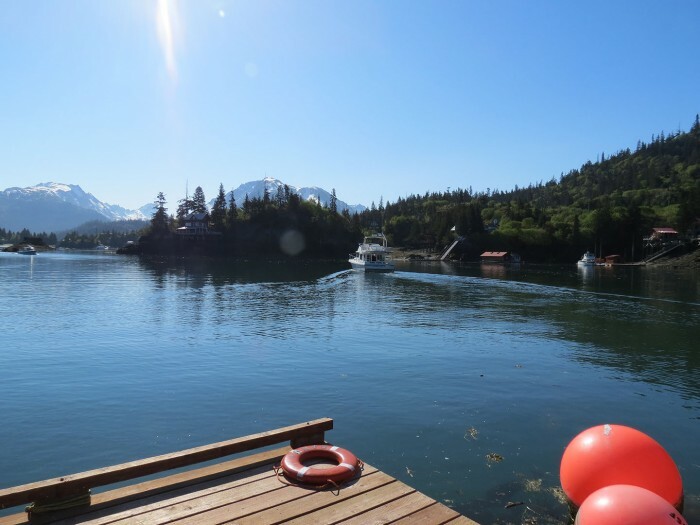 If you have a craving for an Alaskan adventure, I highly recommend this retreat. The next one is scheduled for June 2014. Read all about it at Seams Like Home. And, thanks again Maret! All that was left to do was to pack up and head on down the road, first via the Danny J, then the gorgeous drive back to Anchorage. Alaska still held a few more adventures. So, stayed tuned . . . Right away, Becca found this small anemone, attached to a piece of the giant kelp that was exposed in the low tide. What an exciting outing this was! I learned so much, like the fact that these animals are not called starfish at all, but rather sea stars. They don’t like being picked up and turned upside down either. So, with little hairlike tentacles, they grab onto the hairs on your arms in an attempt to right themselves. Much better now! 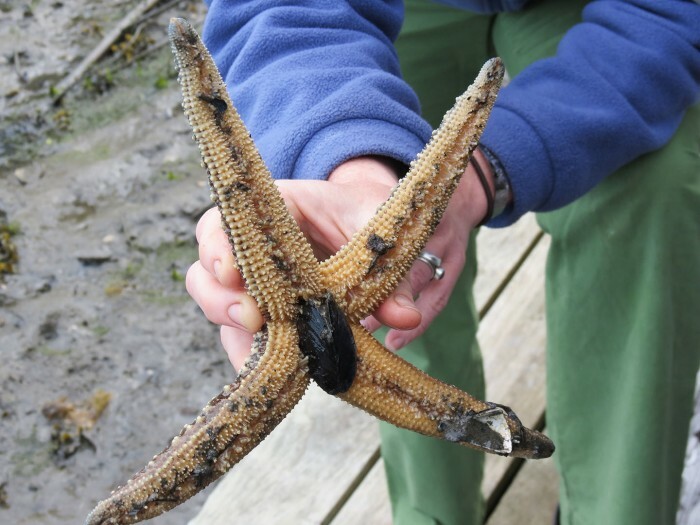 Here’s the not-so-little sea star right side up shortly before Becca returned him/her to the sea. 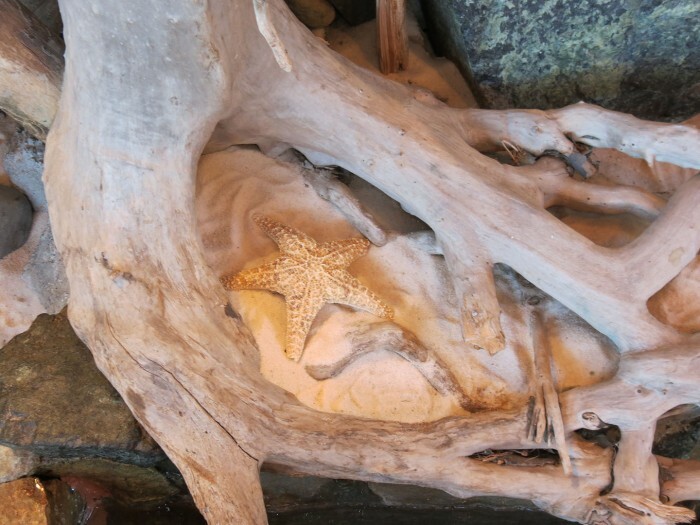 Sea stars are predatory echinoderms, members of the class Asteroidea. This four-legged fellow must have lost one of his legs somehow. Although it should grow back, it hasn’t yet. Nevertheless, he was chomping on a mussel. Sea stars extrude their stomachs into the animals they eat, sucking out the edible portions. 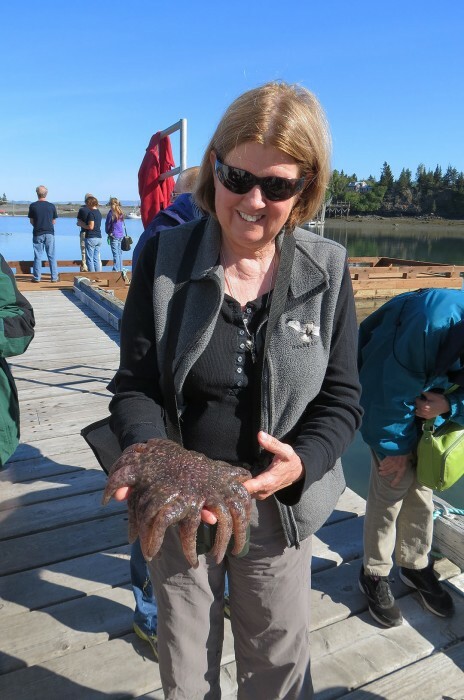 Michele was surprised by the grip of this sea star. 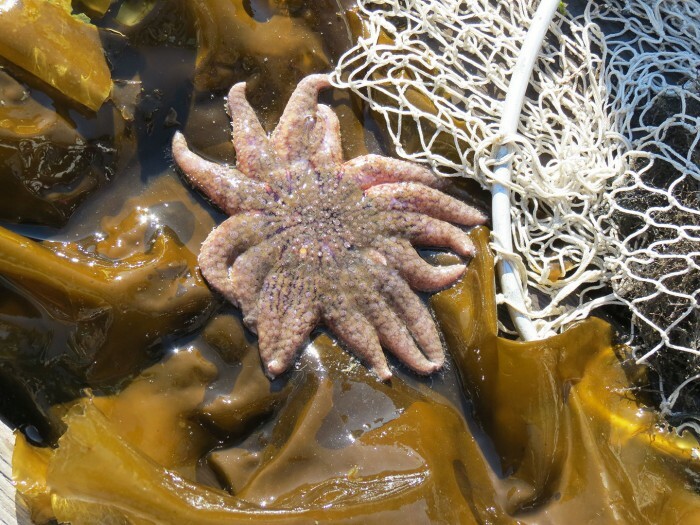 On another trip down to the tide pool, we unearthed two Sunflower Sea Stars. 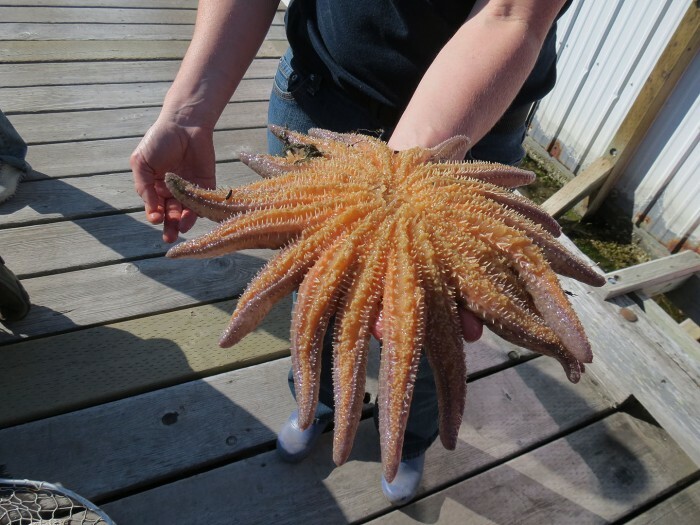 These are the largest and possibly the and fastest sea star in the world. It can move up to 3 meters per minute, and has been known to travel at least 3 km. 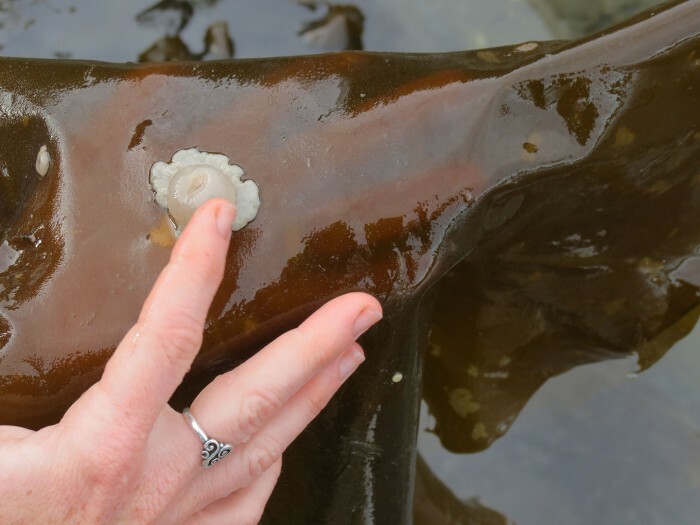 It has over 15,000 tube feet, the little tentacle-like protrusions that help it to move. 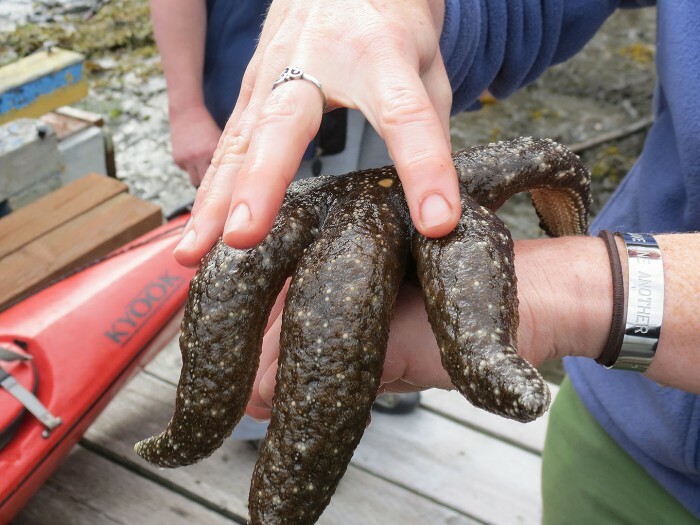 Found mostly in the north eastern Pacific, they are voracious predators, feeding on bivalves, snails, urchins, other asteroids, sea cucumbers, sand dollars, and crabs (in other words, just about anything it wants!). 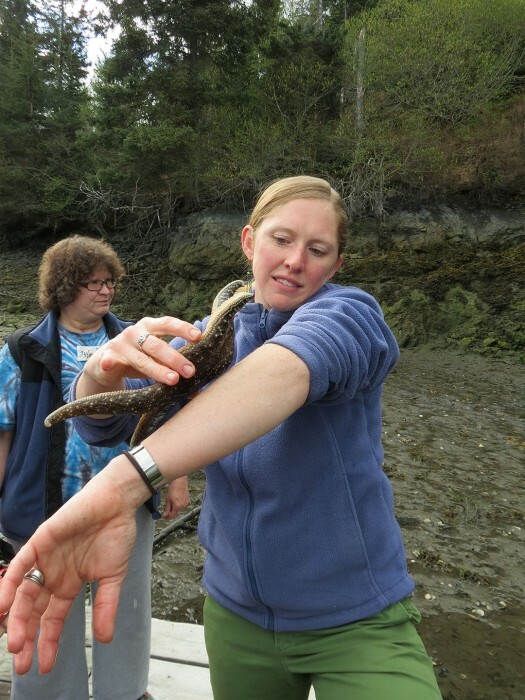 Holding one of these sea stars is rather like holding a large handful of wet slime. The little (yes, he’s still a little one!) one did not appreciate being out of the sea. This one didn’t like being upside down either, but enabled us to see all the little feet trying to right the animal. What amazing creatures these are. 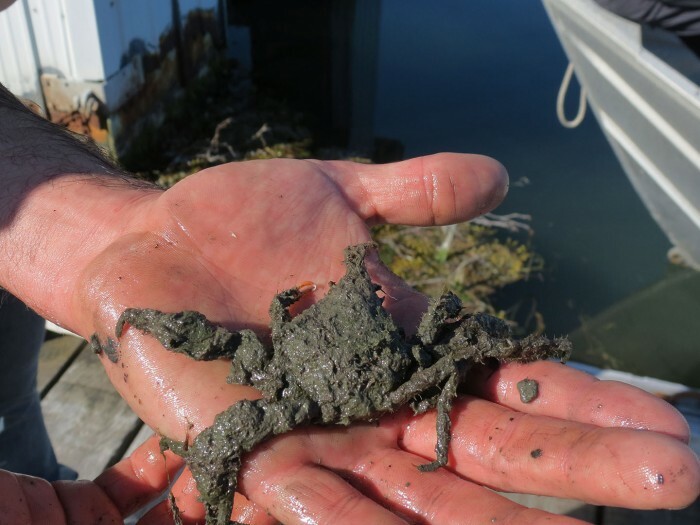 Last, but not least, Lucas unearthed this Decorator Crab from the tide pool. These little crabs ‘decorate’ themselves with various materials to help camouflage themselves from predators, like the sunflower sea star. Our excursion introduced us to the wonders that lurked beneath the surface of the water right at water’s edge! Definitely educational! 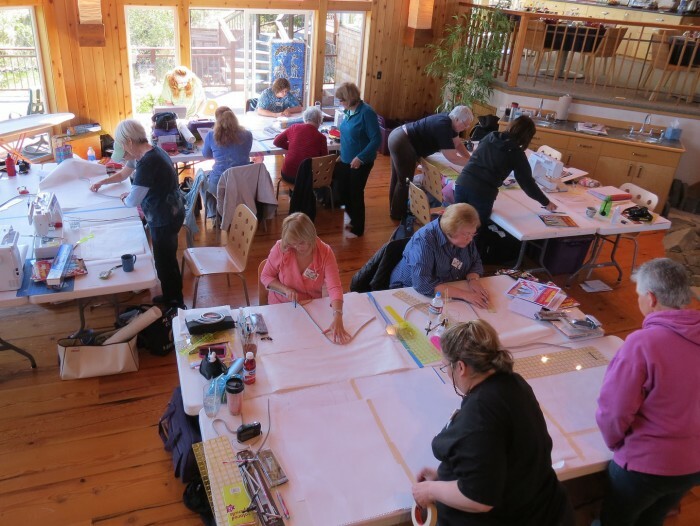 Stay tuned, more stitching ahead . . . .
By days two and three of class, students were making good progress. 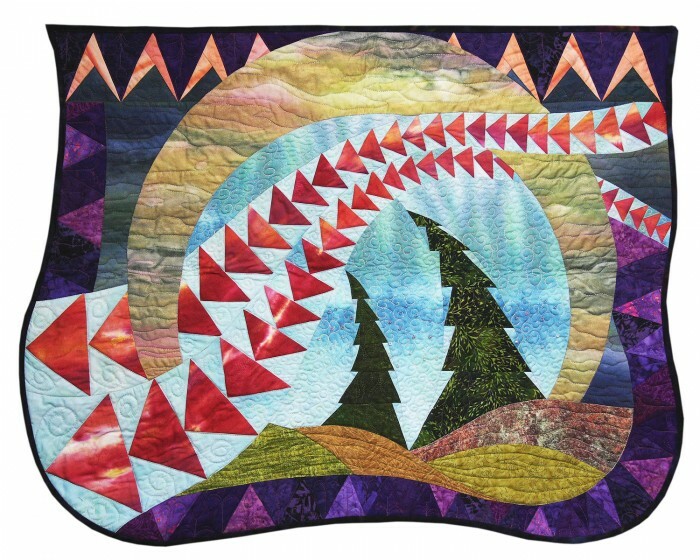 Several of the designs included themes based on the aurora borealis, or the northern lights. Here Debby paper foundation pieces one of the sections of her design. 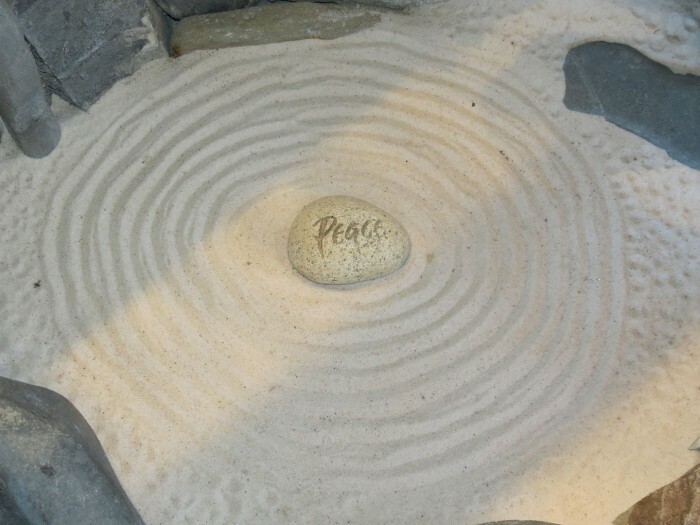 this small design in the sand beneath the wall art. 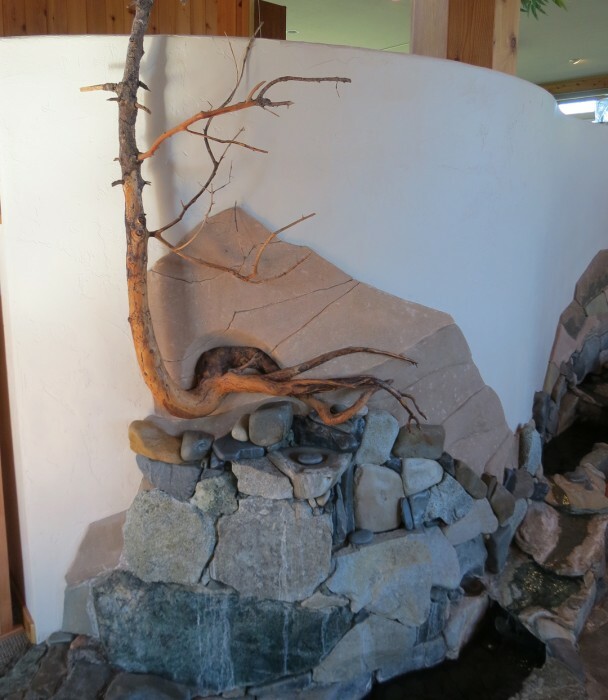 Art is everywhere, strategically positioned to surprise the viewer and inspire all who pass through the doors of Stillpoint Lodge. 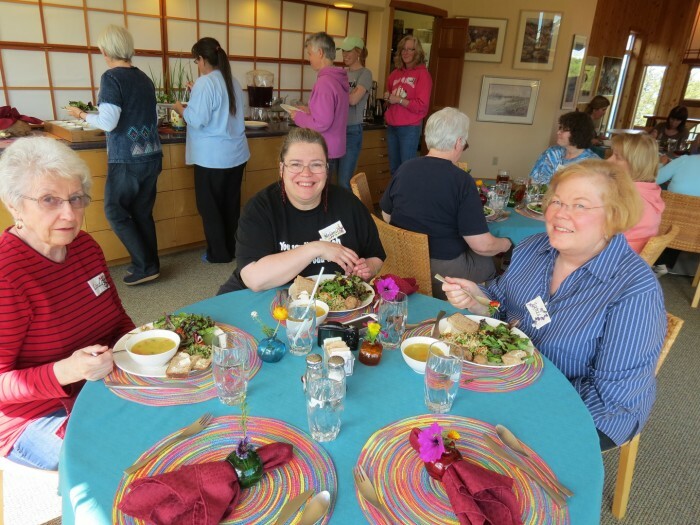 Janis and Debby were table partners, good friends enjoying the class and inspired by our beautiful surroundings. 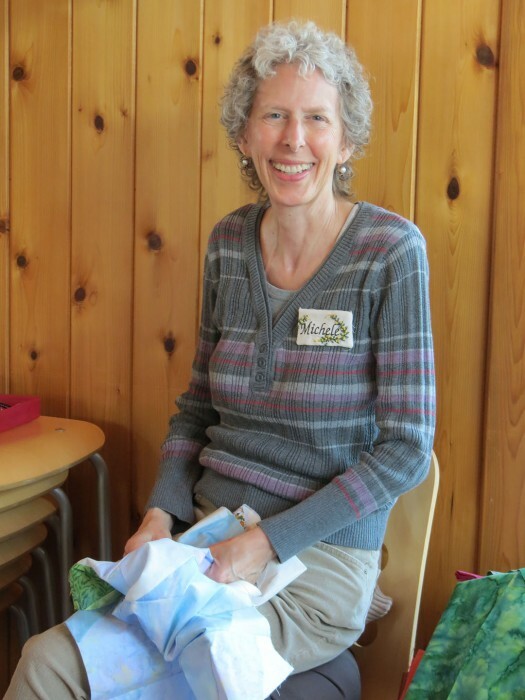 Kathy was one of the first to complete a goose strip. 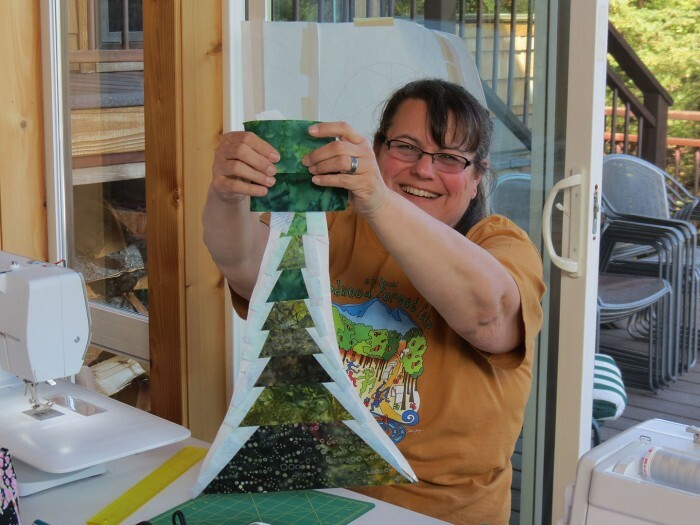 Soon afterward, Janis completed the tiny tree in her design. 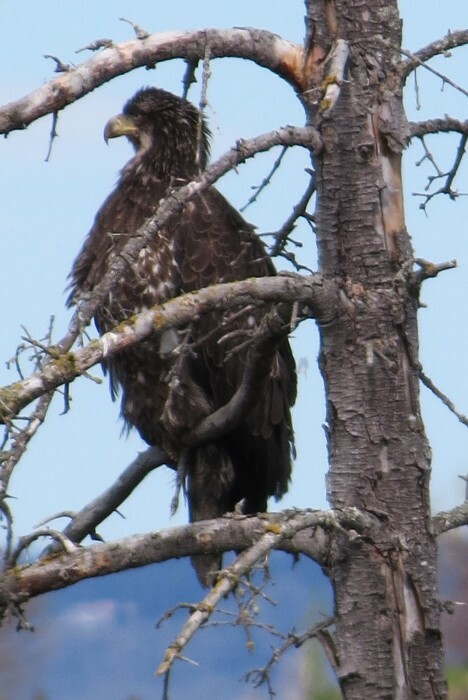 And, all the while, this juvenile Bald Eagle watched rom outside, but also scanned the panorama spread before him/her, a place he called home. 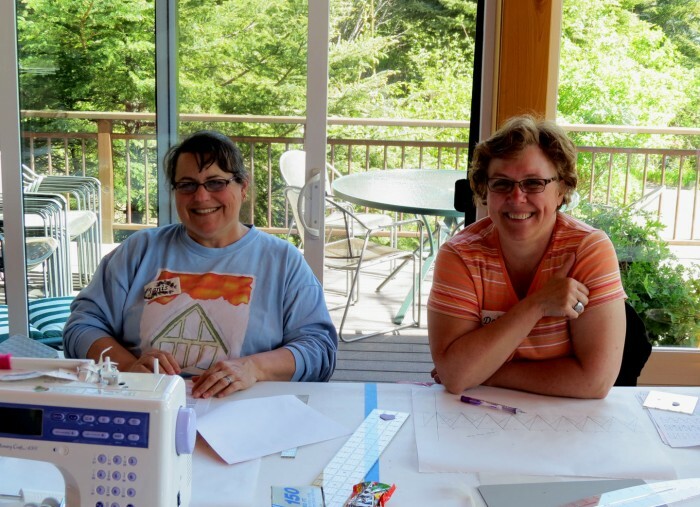 Michele, when not taking photos, spent time working on hand applique for the quilt she is making for her grandson, Henry. 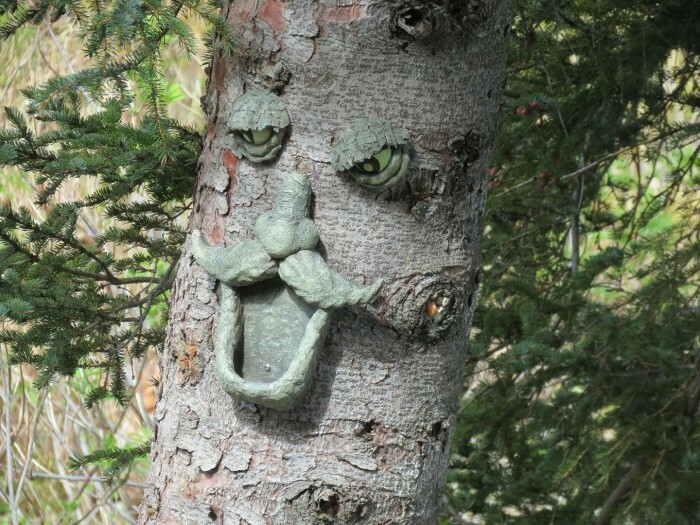 While the Man in the tree looked on through the window. There’s nothing I love more than teaching a multi-day class. 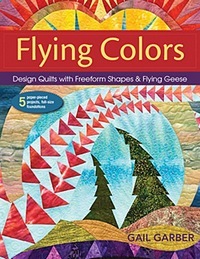 In Flying Colors, we begin by learning about drawing tools that take the ‘scare’ out of that blank piece of paper. 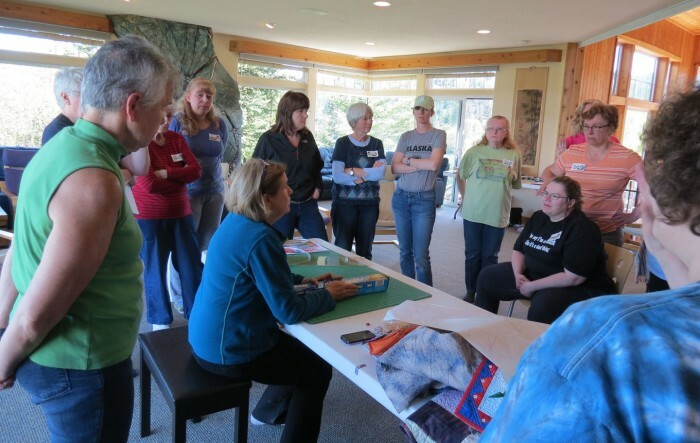 This class was sponsored by Maret Anderson at Seams Like Home in Anchorage, Alaska. 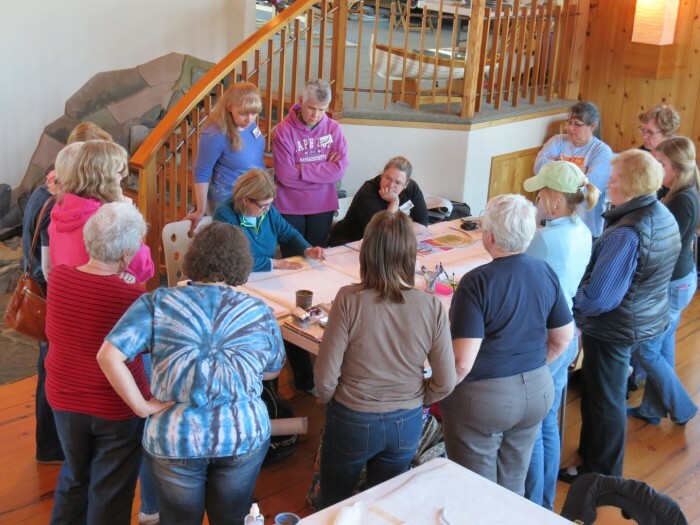 Maret offers this as an annual retreat with a different teacher each year. It is a delightful getaway from the hubbub of our urban lives. 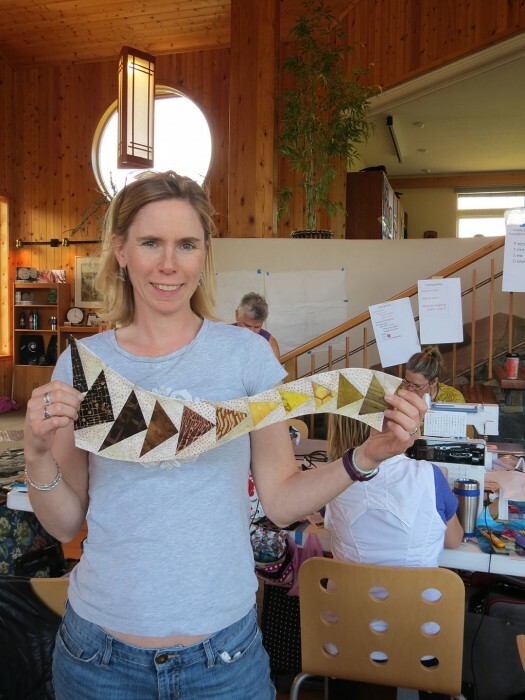 Using easy techniques, students move on to working on their original designs. The facilities at Stillpoint Lodge are spacious and the views spectacular. It is impossible not to be inspired here. Students spend the first day working on their drawings. The designs ranged from simple to complex. Some brought ideas and images with them to class, while others had a blank palette waiting to be filled. 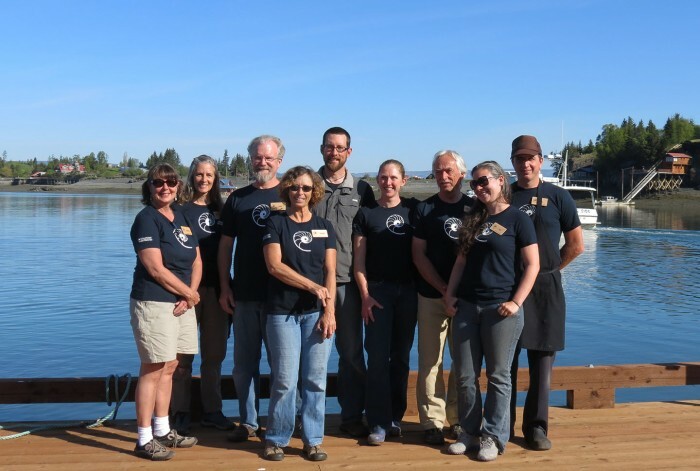 Delicious gourmet meals arrived three times daily, featuring the local seafood and greens grown in the Stillpoint garden. Our every comfort was attended to so we could focus on our projects. 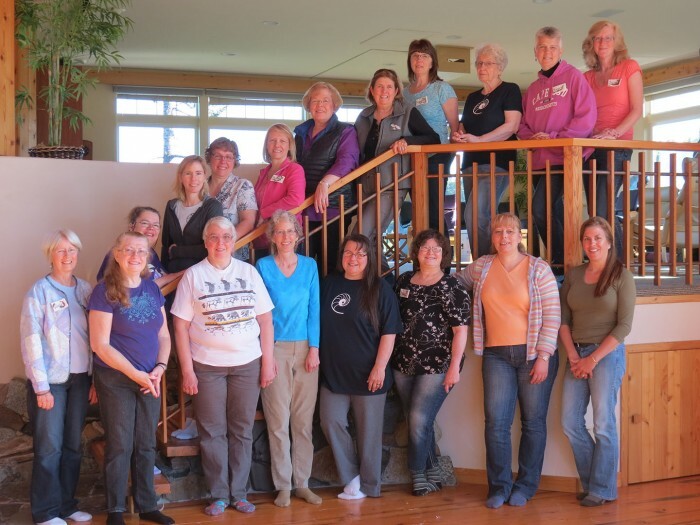 Stillpoint Lodge would be home to 20 of us, Michele and me from Albuqueque, and 18 others from the Anchorage area who would be taking my Flying Colors multi-day workshop (more on that in the next post). The lodge is open only during the summer months and hosts a variety of retreats. 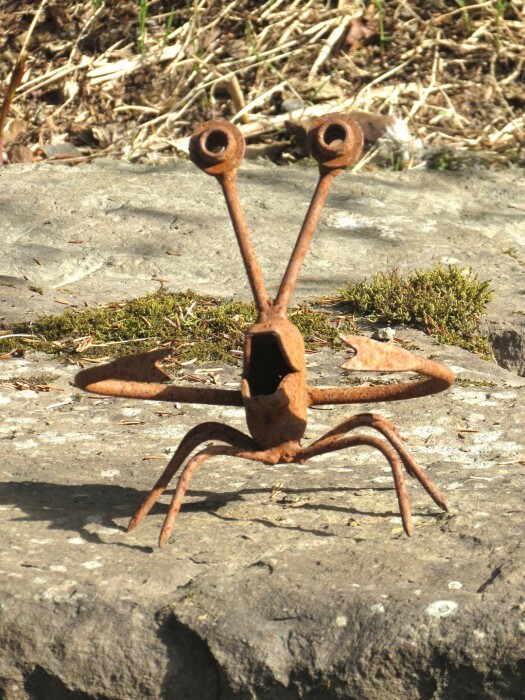 An artists’ pastoral retreat, the grounds boast hidden sculptures and other art, like this little crab that shouted a silent welcome. 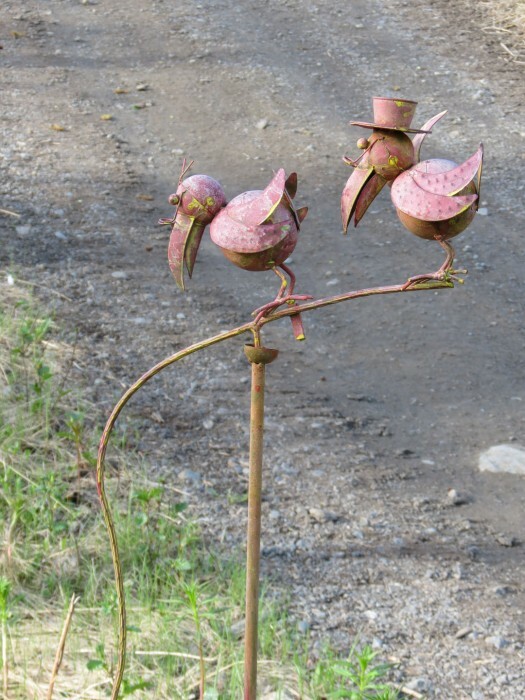 This little pair of birds was strategically positioned alongside one of the walking paths. 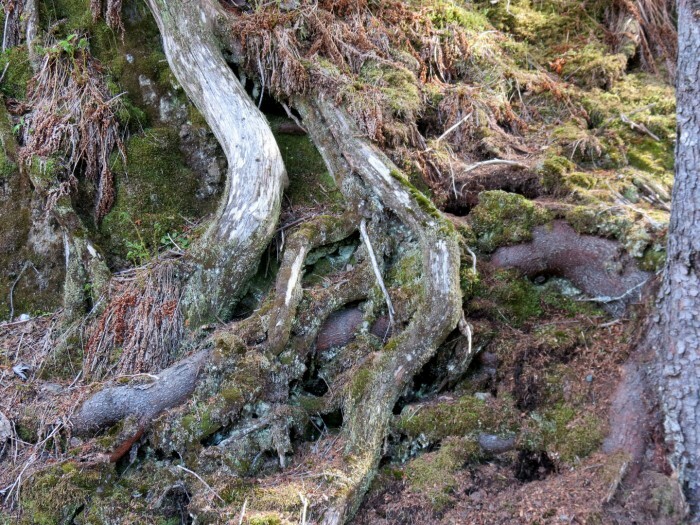 Even the tree roots appeared to be artistically arranged. My favorite view from the lodge was the one from the main room, and my classroom, as well as the deck. 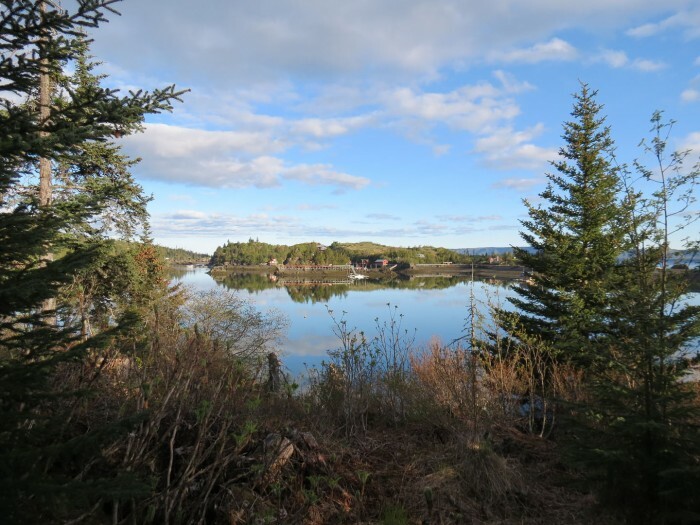 It looks out onto Katchemak Bay State Park. There are glaciers behind them thar mountains! I was shown to my very own little cabin where this pipe art marked the turn off to my path. My cabin was called the Hermitage, a tiny little place with the tiniest kitchen ever. Talk about a well-planned cabin with an incredible view! Not a morsel of space was wasted, but it was comfortable and homey! 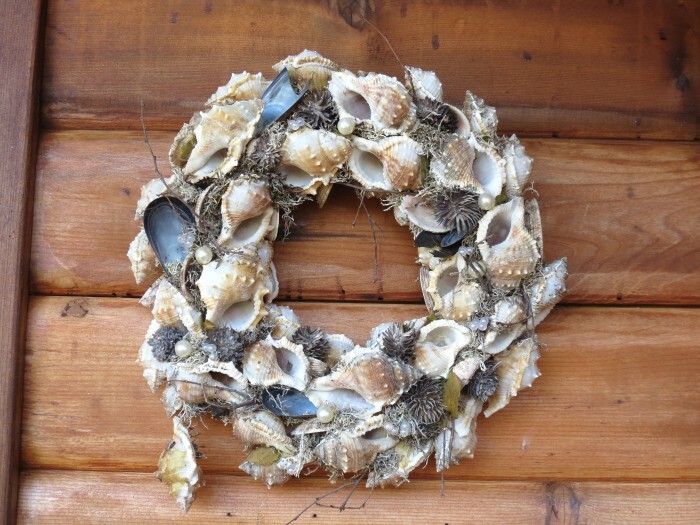 A little shell wreath graced the wall next to my cabin door! 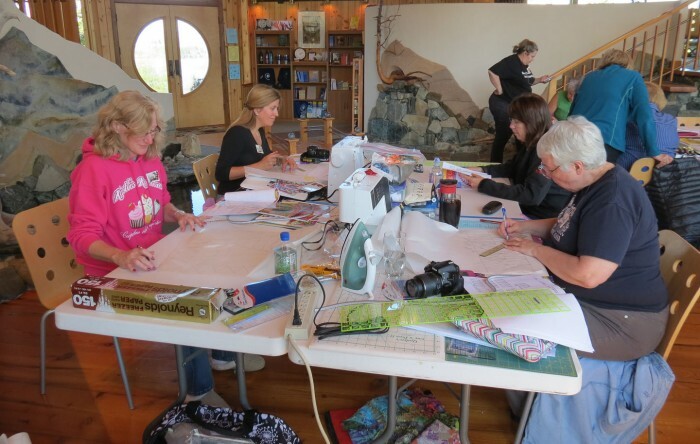 What a restful retreat from the world and a wonderful classroom environment! 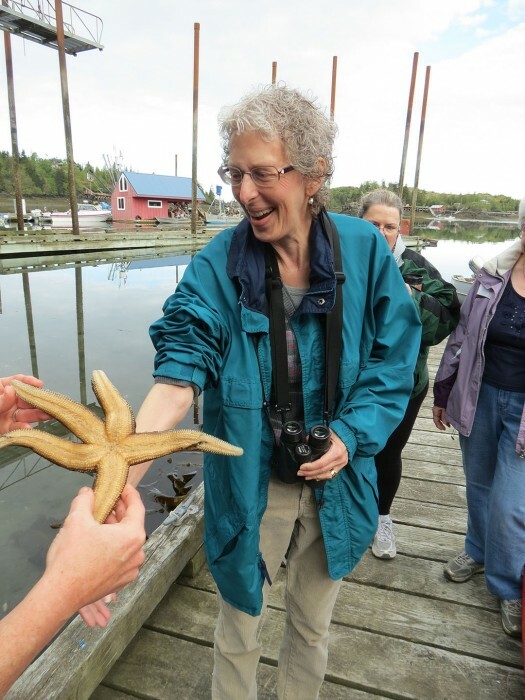 My friend, Michele, who accompanied me on this trip, was sure excited about the boat trip that would take us to Halibut Cove! 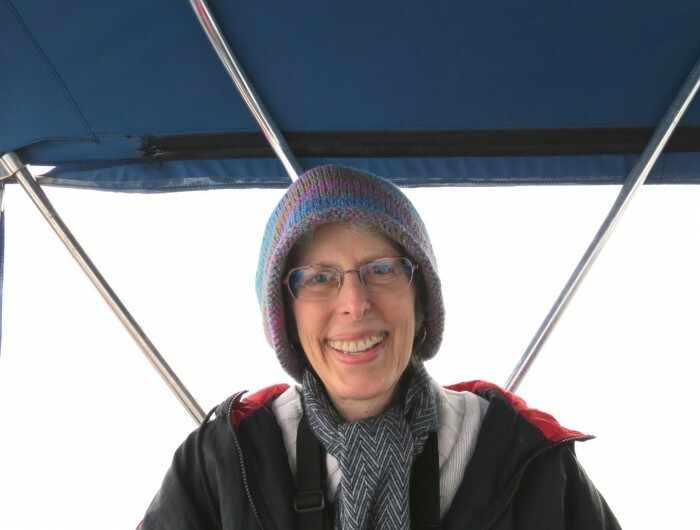 In the end, we took the skiff, not the ferry because the smaller boat could get closer to the famed Gull Island! 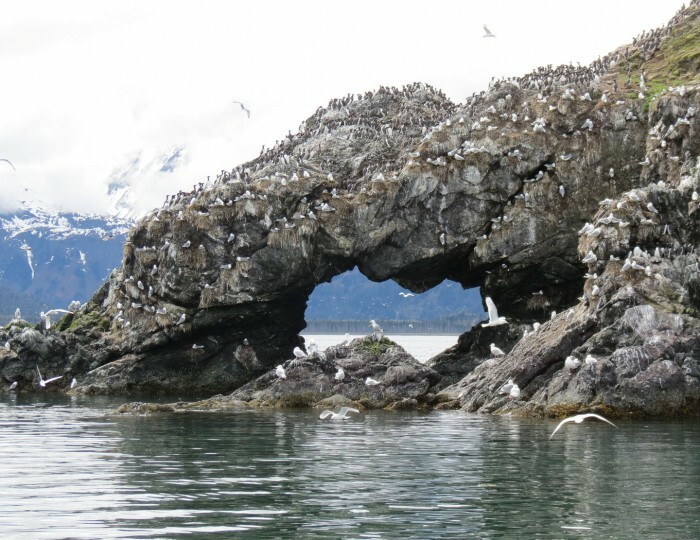 It is a protected island where human entry is not allowed, a place for birds. We were not disappointed either. There were birds everywhere nesting in incredibly tight quarters. A few skirmishes were bound to occur and we witnessed some too. Most memorable were the two kittiwakes that seemed intent on drowning one another and oblivious to our presence. 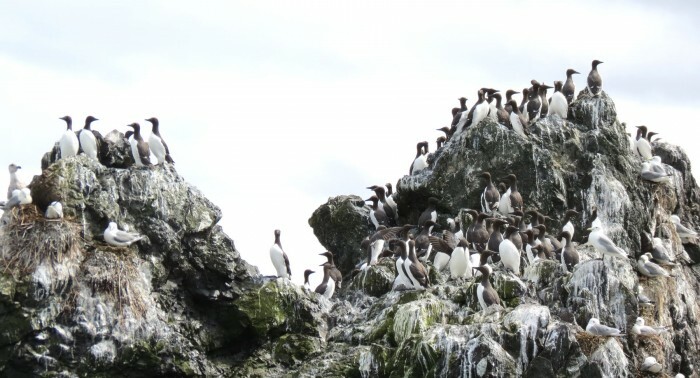 Most numerous were the Common Murres, packed together and surrounded by Black-legged Kittiwakes. We had heard tales of Puffins, but only got a few glimpses of them on the very top of the rock. 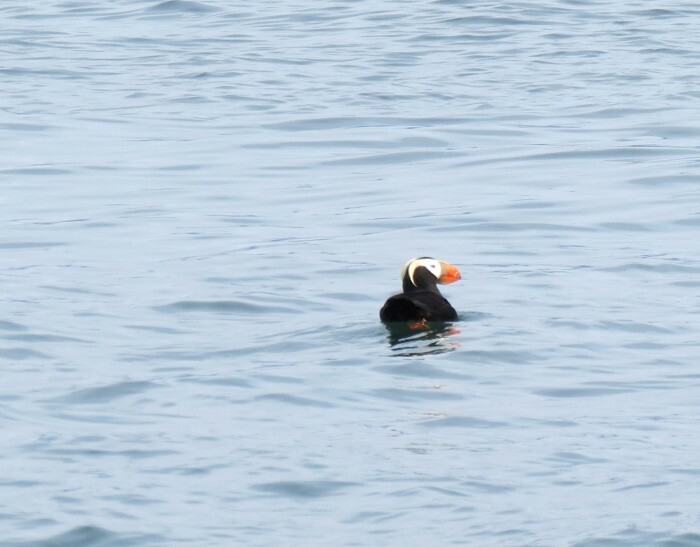 Finally, two Tufted Puffins floated nearby and, with the smaller boat, we were able to get this one image! Cute little devils, aren’t they! It wasn’t but about 45 minutes and we were already pulling into Halibut Cove. We were told that this used to be a ‘perfect’ arch, but part of it collapsed recently. I wonder how long it will be until the land bridge disappears altogether. It was so beautiful, and exciting to think that we would spend the next several days in an area with no cars and no roads. Idyllic might be an apt description of this lovely community that has about 40 permanent residents. 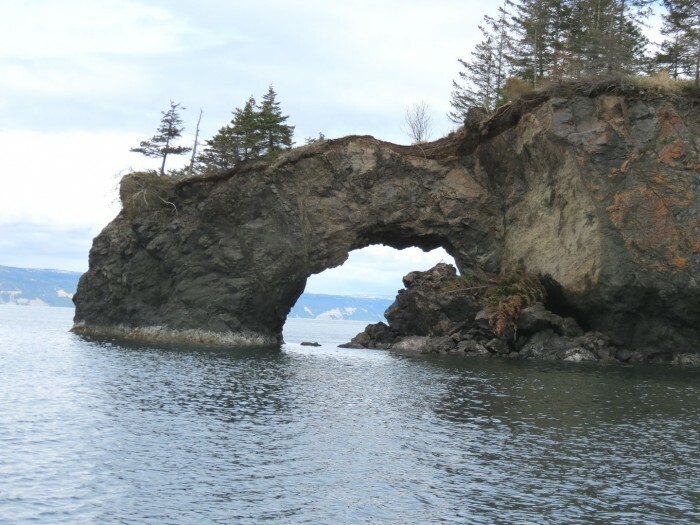 The tides in Katchemak Bay and Halibut Cove can range up to 20 feet, hence the excessively long boat ramps. We dined at the Saltry, the only cafe in the community, accessible only via the local ferry, the Danny J. There, we were entertained by the antics of a cheeky Northwestern Crow who had clearly figured out how to get many free meals! 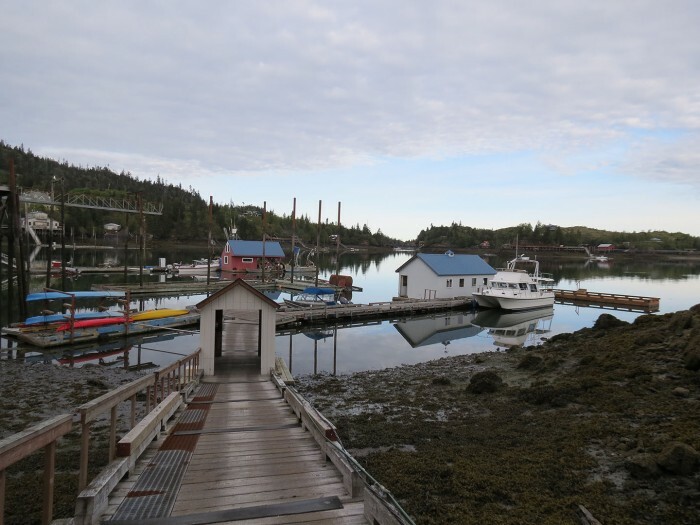 Halibut Cove hosts several art galleries, all connected by a raised boardwalk. One cannot help but relax in this pastoral environment. 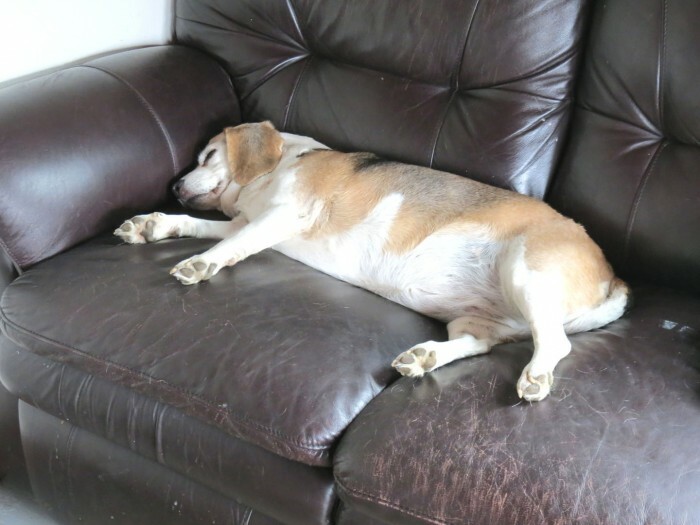 Later, we stopped at the coffee shop, where even the local beagle found a relaxing spot on the sofa. She did seem to have claimed this as her very own. We did not challenge her! After coffee and art, we adjourned to the boat dock to wait for the skiff. 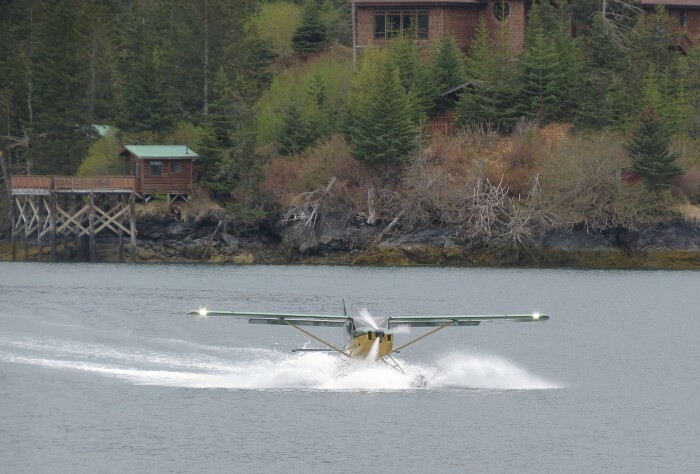 The only other way to get to Halibut Cove is by float plane, like the one we watched landing on the waters of Heavenly Halibut Cove.